A new study of flying cars – formally known as electric vertical takeoff and landing aircraft or VTOLs – finds that they would be “especially valuable” in congested cities or in places where there are geographical constraints as part of a “ride-share taxi service,” as well as play a “niche role” in “sustainable mobility” for longer trips. The study – entitled “Role of flying cars in sustainable mobility” and published in Nature Communications – is authored by researchers at University of Michigan’s Center for Sustainable Systems and from Ford Motor Company’s Research and Advanced Engineering team. They compared the energy use, greenhouse gas emissions, and time savings of VTOLs to those of ground-based passenger cars. The U-M-Ford study of VTOLs – aircraft that combine the convenience of vertical takeoff and landing like a helicopter with the “efficient aerodynamic flight” of an airplane – found that, for 62 mile trips, a fully loaded VTOL carrying a pilot and three passengers had lower greenhouse gas emissions than ground-based cars with an average vehicle occupancy of 1.54. 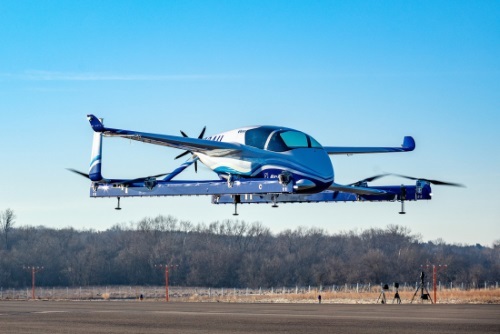 Emissions tied to the VTOL were 52 percent lower than gasoline vehicles and 6 percent lower than battery-electric vehicles, the researchers found. The U-M and Ford researchers used publicly available information from these sources and others to create a physics-based model that computes energy use and greenhouse gas emissions for electric VTOLs that rely on distributed electric propulsion, or DEP, which involves the use of several small electrically driven “propulsors” to fly. The researchers said they analyzed primary energy use and greenhouse gas emissions during the five phases of VTOL flight: takeoff hover, climb, cruise, descent and landing hover. Though VTOLs use a lot of energy during takeoff and climb, they are “relatively efficient” during their “cruise phase when” traveling at 150 mph. As a result, VTOLs are most energy efficient on long trips, when the cruise phase dominates the total flight miles, the researchers said. But for shorter trips – anything less than 22 miles – single-occupant internal-combustion-engine vehicles use less energy and produce fewer greenhouse gas emissions than single-occupant VTOLs. That’s an important consideration because the average ground-based vehicle commute is only about 11 miles, the researchers said. Still, that is not dissuading several private-sector companies from investigating their potential use in the passenger transportation market. Uber, for example, published a 98-page report two and half years ago arguing that developing the infrastructure for an on-demand urban network “vertiports” – VTOL hubs containing multiple takeoff and landing pads, as well as re-charging equipment infrastructure – and single-aircraft “vertistops” made up of a single VTOL pad represent a far lower cost than current surface transportation investments.